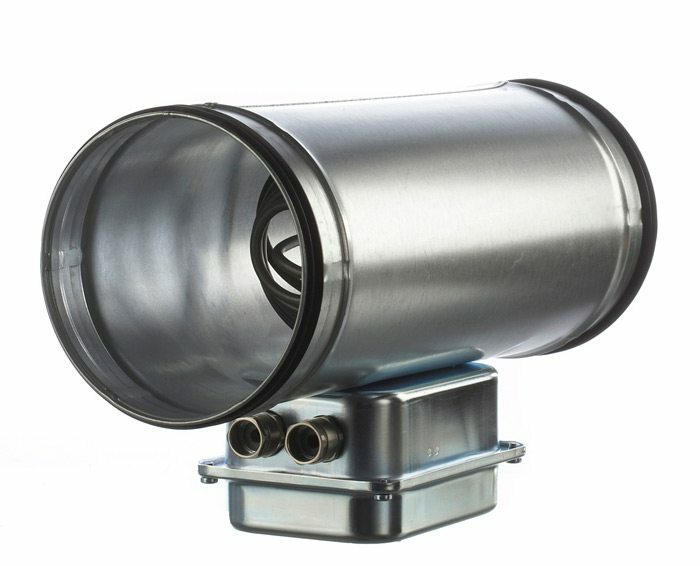 EFR standard duct heaters for 230 V are approved by DEMKO. For the EFR duct heaters Sinus Jevi can offer two types of simple one pole capillary thermostats, which can be used as a room thermostat or with a duct sensor. Both thermostats can be connected directly to the duct heater and use up to 16 A.
EFR is available for 400 V as well as other diameters and output levels. Round galvanised steel tube with a ruber sealing ring in both ends. Electroplated sheet iron box fitted with one PG16 cable gland. Electric supply though the fitted row of clamps. Tubular heating elements made of AISI 304 (stainless) with a surface load of 2.5 W/m² for air velocities above 2 m/sec. In the terminal box there is a built-in one pole thermolimiter (30 – 87°C) with automatic reset as well as one safety fuse (125°C). It is recommended to control the air temperature by a room thermostat, e.g.Pulser or TTC series.